A cage is an enclosure made of mesh, bars or wires, used to confine, contain or protect something or someone. A cage is traditionally use to confine animals as pets, as meat, or in zoos. The original intention of a cage is to create a boundary to enclose a target. However, a cage has a positive intent for protection. Cages consist if many forms and material qualities that can give them a more positive and/or negative appearance. 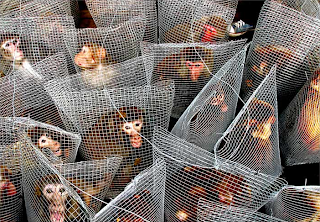 "Even though cages are the most popular symbol for boundary, limitation and isolation the most curious aspect of cages is the action of enclosing with a positive intent and for protection. " Eum, Younseal. "Duality of a Cage." VCU Digital Archives. 13 May 2010. Web. 23 Sept 2010. http://hdl.handle.net/10156/2871. Over the past week I have been cataloging animals and when I went to the zoo I became frustrated with the cages. I began focusing on the cages instead of the animals inside of them. 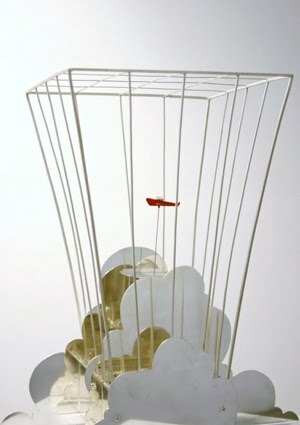 Over the next week or so I want to learn more about cages, the different types, sizes, shapes, and artist who use them.